The sun slides above Diamond head, encasing the skyscrapers of Waikiki in its warm morning glow. There is something about mornings; when the world still feels naive and innocent, quiet and calm. There is something about the sea that seems to heal and transform. “The waves are soft today,” he comments. “You wait. Be patient. Don’t be frustrated, but say your prayers of gratefulness for the day. And watch the sunrise.” He nods towards the bright glimmer of light peeking above the skyline. My body rocks gently as my board carries me above the calm surf. I turn my head toward the waking beauty this weathered and kind surfer appreciates so deeply. “And maybe, you may even make a wish,” he continues. A smile teases the corners of his lips and his eyes dance in a waltz so peaceful and so comforting that I finally feel my world stop its spinning. Last week was one of the messiest and menacing weeks— maybe in my entire life. Between one of the hardest private jet trips I’ve ever done, making a decision to step back from someone I deeply care for, and getting a cold, I thought I had reached my limit. I had thought that from this place, I would have a chance to rest, regroup, and re-think the direction I have been taking my life, my career, and my relationships. Then, I got the call. There had been a kitesurfing accident. He, my favorite adventure buddy and the person I chose to step away from for reasons I will keep private, had hit his head and was in ICU. But, he was speaking to me and although none of this made sense, he ironically made sense; even amidst the trauma of a brain injury. “I’m so sorry, and I love you. I just needed to tell you that.” I didn’t ask what happened, but simply said, “It will take me two hours to drive to the hospital, but I’ll be there as soon as I can.” He didn’t expect me to show up, but how could I not? When it comes to life, forget the titles and what-ifs and just be there when you are needed. I don’t spend much time in hospitals. They feel very foreign to me, but when I walked into his room and he turned to the sound of my voice and smiled, I was just thankful that I could be there. That I could see that smile. That regardless of what was or would be, there was the current moment. “So, you had to put yourself in the hospital so that I would come see you before my next trip?? ?” I said teasingly. “I swear it was an accident, but it worked, didn’t it?” he responded with a bit of signature sass. Oh, how much did I appreciate that attitude now! A week later, I cannot even fathom how much grace has lovingly been showered upon my existence. I write this as I stare at the tropical teal energy of the ocean continuously lapping upon a sandy beach. Instead of honoring the passing of someone’s life, a FaceTime call interrupts my writing. He tells me that his head hurts and that I need to not be so grumpy. I grin. “Well, remember, you hit your head pretty hard, and I’m just doing something right now. Call you later?” Sure. This accident has not necessarily changed my perspective, made me slowdown with work, or changed my day-to-day activities. What it has done, though, is made me think critically about my life trajectory and the ways that I spend my time. It also has made me wonder if I really do like kitesurfing as much as I thought I did. 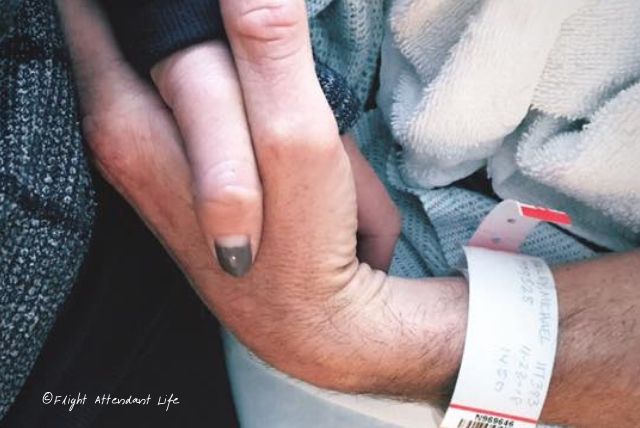 This experience, although completely and fully M’s, has made me more aware of the fragility of life and that sometimes, all we really can do is say, “Thank you.” To all the people who cared for him in the hospital. To all the friends and family who support you and I in the roughest moments in our lives. For the strength that we don’t often realize that we have. November was riddled with challenge and stretch. If it was only work that demanded so much, I would have felt like it was beyond my capacity. But no— work was for once the one area that I could “coast.” Or, it wasn’t that I put all on cruise control but just gave up worrying. I didn’t have anymore energy to worry. How I didn’t completely crumble is beyond me and a testament to God’s precious care. It is in the most challenging moments of our entire lives we see God’s grace, peace, and power more fully. We can become caught up by all that is happening around us, so much so, that we often forget to just turn to the mountain, watch the sun rise above the sea, and say that prayer of gratitude. We forget to revel “in the wait” and be patient for the next set to roll in. We are so preoccupied by catching waves, keeping score, or one-upping our last best day, that we lose our focus on the One who truly made the beauty we play and work and thrive-in and that holds all in His hands. What if we just rested in the beauty of what is because this is truly all that is guaranteed to us. The challenging lessons and blessed moments thrown in our path are opportunities to grow and discover who we are truly created to become. To show us how much God loves us and wake us to a purpose beyond our wildest dreams. Raise your head, Darling and look at that horizon. I know it’s dark right now, but the sun always rises.